Images taken from the world's highest observatory, in the Chilean Andes, show the galaxy in extraordinary detail, 11.7 billion light years away from Earth. Astronomers at the European Southern Observatory [ESO] in Chile have used the technique of gravitational lensing and a virtual telescope to produce unprecedented images of a monstrous galaxy 11.7 billion light years away from Earth. The images of the galaxy, named SDP.81, were modeled using equipment at the European Southern Observatory [ESO], located on the remote Chajnantor Plateau in the Chilean Andes. The observatory's Atacama Large Millimeter/submillimeter Array [ALMA] is a telescope consisting of 66 high-precision antennas, spread over distances of up to 16 kilometers. The telescope, also known as an interferometer, is equipped with antennas which work together to collect light from near and distant objects in the universe. They act as a huge virtual telescope which is able to take images at a resolution up to six times higher than those taken in infrared with the Hubble Space Telescope. Using ALMA, the astronomers at the observatory used the technique of gravitational lensing to study the galaxy, which is 11.7 billion light years from Earth. A large galaxy located between SDP.81 and Earth was used by the astronomers as a lens to study the more distant body; this smaller galaxy magnified the light of its more distant relation and warped it. This effect is an example of "Einstein's Ring," a type of gravitational lens which bends the light from the object behind it. 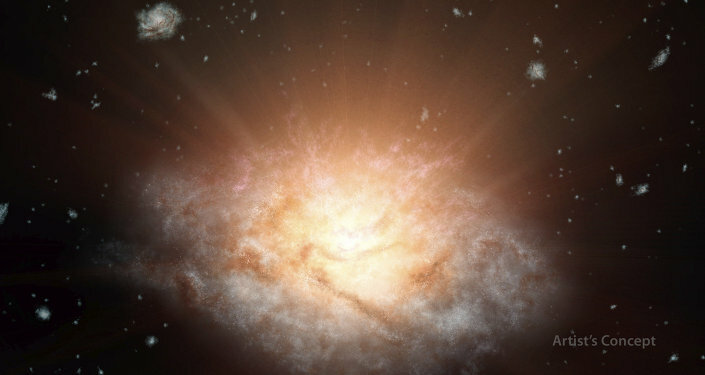 "The ALMA image of the reconstructed galaxy is spectacular," said Rob Ivison, the ESO's Director for Science. The resulting reconstructed image of the distant galaxy using sophisticated models of the magnifying gravitational lens, reveal fine structures within the ring that have never been seen before: Several dust clouds within the galaxy, which are thought to be giant cold molecular clouds, the birthplaces of stars and planets. The images produced reveal giant dusty clouds in SDP.81, thought to be made up of cold molecular gas, from which stars and planets are formed. Alma was not able to detect the center of SDP.81; the astronomers suspect this is due to the presence of "a supermassive black hole more than 200–300 million times the mass of the Sun" in the smaller, closer galaxy which allowed SDP.81 to be reconstructed. "ALMA's huge collecting area, the large separation of its antennas, and the stable atmosphere above the Atacama Desert all lead to exquisite detail in both images and spectra. That means that we get very sensitive observations, as well as information about how the different parts of the galaxy are moving. 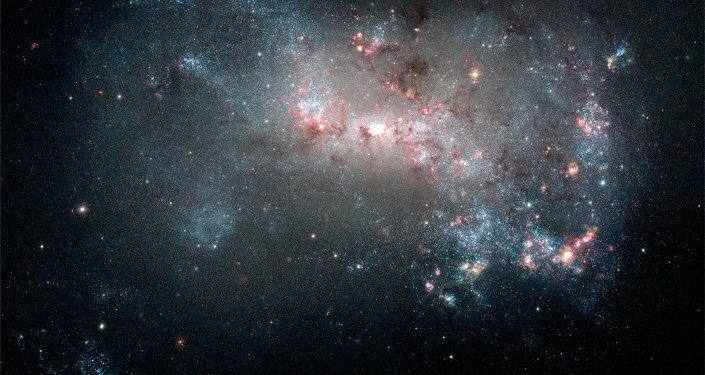 We can study galaxies at the other end of the Universe as they merge and create huge numbers of stars," explains Ivison. The ALMA telescope is the most complex astronomical observatory ever built on Earth, construction of which was completed in 2014. The facility enables research into the physics of the cold Universe, the first stars and galaxies, and directly images the formation of planets. 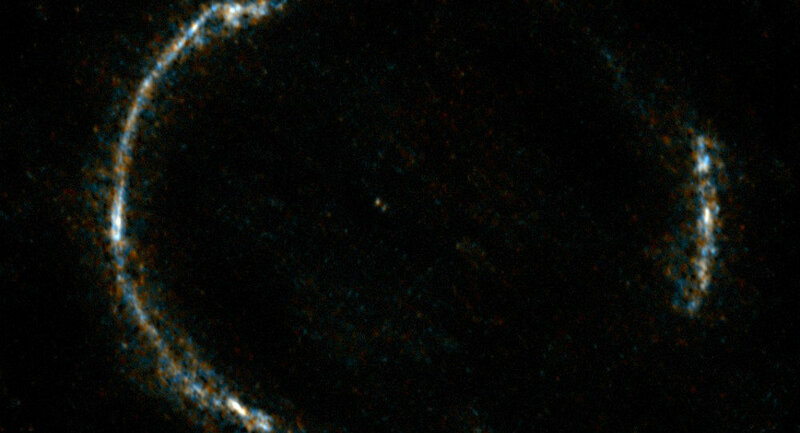 The image shows the foreground lensing galaxy (observed with Hubble), and the gravitationally lensed galaxy SDP.81, which forms an almost perfect Einstein Ring, is hardly visible. "The more distant the galaxy, the further back in time one is looking, so by measuring their distances we can piece together a timeline of how vigorously the Universe was making new stars at different stages of its 13.7 billion year history," explained Joaquin Vieira of the California Institute of Technology, a member of the team studying the universe from ALMA. Galaxy SDP.81 is seen by ALMA just 2.4 billion years after the Big Bang, when the Universe was only 15 percent of its current age. 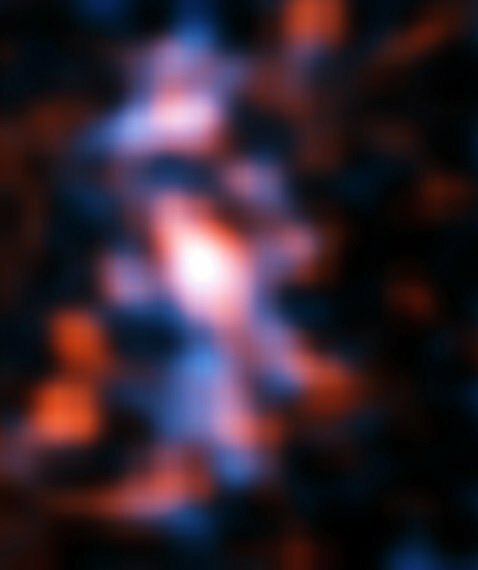 The smaller, closer galaxy which helped ALMA to model SDP.81 is four billion light years away from Earth; the light from SDP.81 took 11.4 billion years to reach Earth, more than twice the age of our planet.